India’s state-owned banks need a government bailout. The country’s wobbly public sector lenders require around $45 billion to put their balance sheets on a firmer footing, according to a Breakingviews calculator. That’s a bill the new government can ill afford. But if it acts fast, it may be able to take advantage of the post-election euphoria to persuade private investors to put up some of the cash. A recent report from the central bank described India’s 21 public sector lenders, which include State Bank of India, Bank of Baroda and Punjab National Bank, as “fragile”. That’s the polite term. Several years of slow growth have strained the industry: bad debts in the whole banking sector reached 4.4 percent of total lending at the end of December, up from 3.7 percent a year earlier. For state-controlled groups the figure is closer to 5 percent. And that’s just the dud credits they own up to. Public sector banks, which account for three-quarters of India’s total lending, are notorious for rolling over loans to politically sensitive borrowers. The real figure may be as much as twice as large. Another worry is problem loans which borrower and bank have renegotiated. In the aftermath of the 2008 crisis, Indian regulators gave banks some leeway in how they treated these “restructured” credits. The predictable result is that the loans in this category trebled in three years, reaching 2.9 trillion rupees ($49 billion) by the end of 2013. That’s greater than the official stock of bad debt. A significant proportion is to borrowers who probably cannot pay. If these two factors weren’t enough of a headache, India is also raising the bar for how much capital banks must hold. The Reserve Bank of India, the central bank, has interpreted new Basel III rules so that lenders must have Tier 1 capital equivalent to 8.88 percent of their risk-weighted assets by 2018, up from 6.5 percent today. 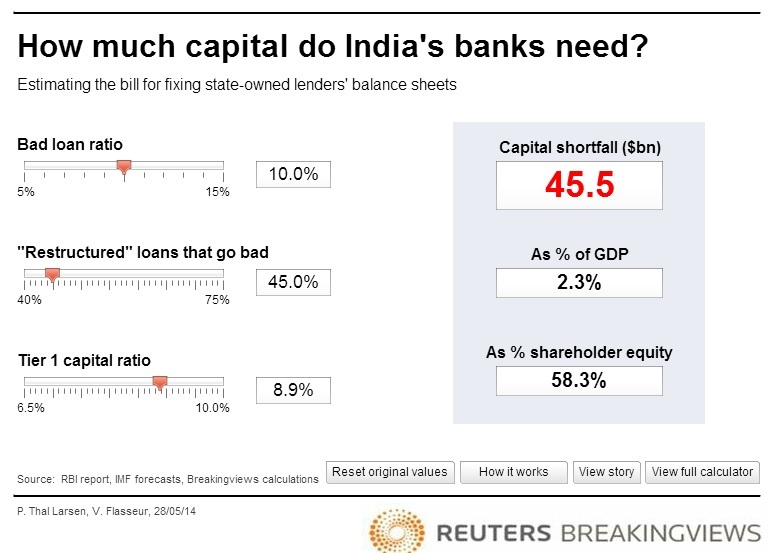 A new Breakingviews calculator, based on RBI data, shows the size of the potential capital hole. Start by assuming 10 percent of all loans and 45 percent of “restructured” loans are duds. Then require lenders to set aside provisions worth 70 percent of the face value of those loans. Finally, make banks hit the higher 2018 threshold for Tier 1 capital today. In this admittedly harsh scenario, India’s state-owned banks would need more than $45 billion of capital – more than half of their existing equity base. The government is on the hook for most of this. Though many public sector banks have stock market listings, the state is legally required to maintain a majority stake. Prime Minister Narendra Modi’s new administration may eventually try to ditch that rule, but only if it can get a bill past the upper house of parliament, which it does not control. The new administration is unlikely to welcome the idea of pumping more than 2 percent of GDP into the financial sector. But delay will only make matters worse. The longer that banks hide past mistakes, the fewer new loans they will make. That will restrict the flow of credit, limiting the economy’s capacity for growth, and making the bad debt problem larger. The government can take steps to minimise the final bill. A large chunk of the bad loans are to infrastructure projects – particularly power plants – that are in trouble partly because they lack the necessary permits. If the new authorities can clear these bottlenecks, some of the bad debt may eventually turn good. The most promising way to reduce the cost to Indian taxpayers, however, is to bring in the private sector. Institutional investors may be reluctant to buy more common equity while the government is still in control. However, banks could issue other forms of capital, such as preference shares, or bonds that are written down in a crisis. India’s recent stock market rally will help: the S&P BSE Bankex index is up 34 percent so far this year. Over time, state-owned banks will need more thoroughgoing reform. Many are inefficient and run according to political rather than financial priorities. A wave of consolidation, led by stronger players, could help. But no amount of restructuring or improved governance can compensate for a shortage of capital. If the new government acts quickly, it could set off a positive feedback loop whereby an improved supply of credit feeds faster economic growth. Delay, and the final reckoning will only be more painful. How much capital do India's banks need? The financial position of India’s state-owned banks is fragile, according to a report on the governance of Indian lenders published by the Reserve Bank of India on May 13. The report by the Committee to Review Governance of Boards of Banks in India published the results of a stress test outlining the capital shortfall at state-owned lenders. It concluded that, in the most severe scenario, state-owned banks could need as much as 1.47 trillion rupees ($25 billion) in additional capital in 2014. By 2018, this figure would rise to as much as 5.87 trillion rupees. P.J. Nayak, former chief executive of Axis bank, was chairman of the committee. In its assessment of India published in February, the International Monetary Fund estimated that the bill for recapitalising state-owned banks could range from 3.3 percent to 7.9 percent of GDP, depending on the severity of the stress test scenario employed. The government’s share of this figure would range from 2.1 percent to 5 percent of GDP. State Bank of India (SBI), the nation’s biggest lender, on May 23 reported a drop in bad loans and quarterly net profit that beat forecasts, sending its shares to their highest level in three years. It said gross non-performing loans as a percentage of total loans fell 78 basis points sequentially to 4.95 percent in the March quarter.